Bloom Farms is a socially-conscious company, which is a nice change of pace in the midst of the Green Rush. So many companies run by an all-white leadership board seem overly concerned with the bottom line, while people of color are still serving lengthy or life sentences for trumped up drug-related charges. We are in dire need of a marijuana revolution that echoes outside of the marketplace. Bloom Farms works ethically on numerous levels. It operates with a one-for-one business model, so for every sale, it donates a meal to a local food bank. Last February, Bloom Farms reached its 1 millionth donated meal. The company recently expanded into Nevada and, as founder and CEO Michael Ray pledges, “every product sold in Nevada will generate one meal to a Nevada based food bank.” I’m impressed. The cannabis company also teams up with small farms in California’s renowned Emerald Triangle, specifically Sun Roots Farms, for the sun-grown, single-origin, whole cannabis plant raw materials. The result is thoughtfully produced strains that are resilient, resinous, and effective at relieving pain, high stress and insomnia. This Jah Goo, a cross between Purple Jasmine, a floral 70/30 indica-dominant strain, and Goo strains, is cultivated by Sun Root Farms and helps users deal with complex trauma, injuries and other mood issues. As a socially conscious smoker, I want to put my hard-earned bucks towards companies doing it right. Let’s dive into the specifics of this Jah Goo vape. This Jah Goo .5g vape cartridge from Bloom Farms comes packaged in a paper box that’s sturdy, recyclable and environmentally friendly. It’s appropriately tamper-sealed with a label that describes the product. The individual pod comes in a unique screw-top container. Due to California’s new regulations, it’s not the easiest product to open, you’re going to need some patience! The packaging is eye-catching with Bloom Farm’s award-winning design. I particularly love the branding of their stylish cannabis flower. The product and carton itself are clearly labeled without being redundant. There’s plenty of information, all of which is now required, but it’s also good to know. I see THC & CBD content (355 mgs or 71% THC, 2.0 mgs or 0.4% CBD), dosage, net weight, batch and testing information available as well. The proper government warnings for both Prop 64/65 are also included. Bloom Farms also mentions, in loud lettering, that this pod is only compatible with the Pax Era pen. Again, the pod itself is very sleek and modern. It’s compact and fits perfectly inside the PAX Era. The cartridge specifies Bloom Farms as the maker and Jah Goo as the strain. Few other companies include their name and strain on the actual cartridge or pod. This helps me quickly identify what cartridge I’m using, rather than playing roulette based on effects, smell, etc. The mouthpiece is a nice size, not too large or small. The cartridge can get hot if you use it frequently for more than seconds each time, but other than that, it’s fine. The Pax Era cartridges always have the same look, and feel – it’s tricky to tell them apart without the packaging. However, most of them work without fail. While others might find it bothersome that you need a PAX Era to enjoy these pods (as well as others from different companies), I feel the tradeoff of being able to control your temperature down to the degree truly sets this product apart. The Jah Goo cartridge easily slips in the device and you can start using immediately; no battery clicks or voltage settings to adjust. It even comes with an app for your phone to control the colors and temperatures with the touch of a finger. This product’s temperature control feature allows you to draw more flavor or more vapor. The lower the temperature, the more terpenes, and flavors you can taste, such as musky piney limonene, terpinolene, humulene. When you go higher, you can still experience yummy flavors, and the pod produces more vapor without it tasting “burnt.” Jah Goo offers earthy notes with a sweet exhale the lower you set the temperature. At a higher setting, you start losing those sweeter notes and begin tasting the piney and gas notes from this indica. A few puffs between 515ºF and 540ºF produced the perfect combination of vapor and flavor that was pleasant to smoke. I loved how Sun Roots Farm’s oil in the chamber is a rich golden color, clear and thick. However, it’s not overly thick which would make it hard to vaporize, nor is it too runny – an attribute that would make me suspect a manufacturer “cut” the oil with common additives like propylene glycol (PG) and vegetable glycerin (VG). After a couple puffs of the Jah Goo, my mind was at ease, my body was becoming more relaxed and boy, was I hungry – pass the Doritos! It didn’t take more than three or four puffs to get the desired relaxing and indica typical effects that come from a strain like Jah Goo. It’s perfect for evening use. At around $50 to $60 for a half gram, for the potency and flavor profile that you get from this pod, I would say that it’s definitely worth the money. The packaging, information, and product quality definitely show with its price tag. Tough to open due to new CA regulations. Sleek, eye-catching branding and prominent logos. Most of the required information. Includes THC and CBD content, dosage, net weight, batch and testing info. Bloom Farms would have gotten a five had they gone extra mile with a more refined cannabinoid profile. Pod is sleek, modern and compact. Bloom Farms labels the actual pod, so you can distinguish between strains. Mouthpiece is a perfect size; can get hot from frequent use. At a slightly lower temp setting, pungent and sweet flavors storm the gates. Piney and gas notes at higher temperatures; never tastes burnt. With some settings fiddling, you can set the temperature of the Pax Era to suit your vapor vs. flavor needs. Higher temps make it possible to blow some sick rings with this pod. What you want to see: liquid gold and runs easily when you rotate the pen, but not so thin that you suspect cutting agents. Subtle cerebral high coupled with a total body relaxation. For Harry Potter fans, the effects are kind of like a happy-giggly Petrificus Totalus. Easy breezy if you have a Pax Era battery (if you don’t, you’ll need to buy one). No battery clicks or voltage settings to adjust. Phone app lets you control the colors and temperatures with the touch of a finger. My ABCs for Pax Era cartridges are Automatic, Battery-Specific, and Customizable. Cartridges have the same look and feel. At $50 to $60 per half-gram, the price is justified for this high-quality product. Great for people who consume moderately but who still want something heavy-hitting. If you’re a heavy consumer, you may want to look elsewhere for more bang for your buck. With the convenience of a Pax Era pod, the potency of Sun Roots Farms single-origin strains, and the efficacy of a specialized indica-leaning hybrid, you really can’t lose. This Jah Goo .5g vape cartridge offers an enjoyable cerebral “headiness” and made my entire body relax. Even with a $50-60 price tag, you can trust that you’re buying the best from the best. 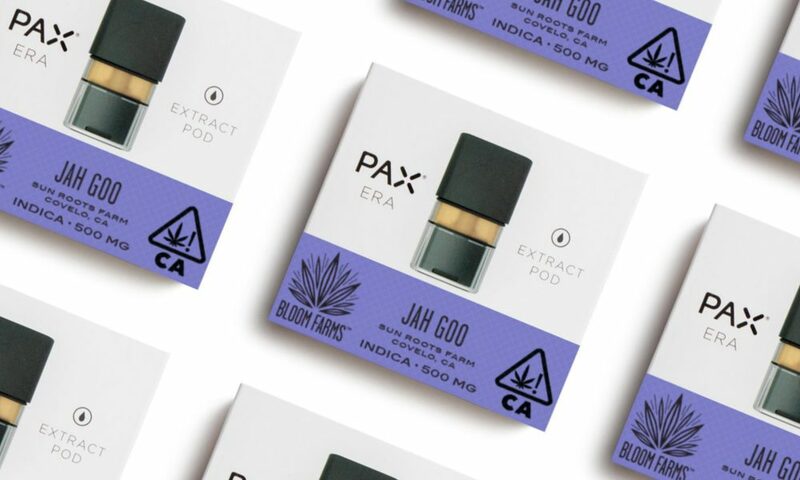 If you live in L.A. and are ready to be wowed by Bloom Farms’ Jah Goo PAX Era Pod, click here to see if Nugg Club delivers to your address!